Saartje's Booties the Bockstark way. That's got to just be the best name for a pattern ever. Even though it does take kind of a while to say. I have to confess something: I had originally refused to knit anything for this baby. 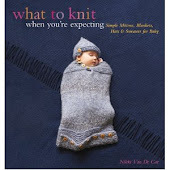 I was in panic mode, all in a flurry over how many things I had lined up to knit, and how was I ever going to find time enough to knit for My Baby, as though nine months were an incredibly short period of time, and as though pregnant women are running around constantly and not lying still and knitting. 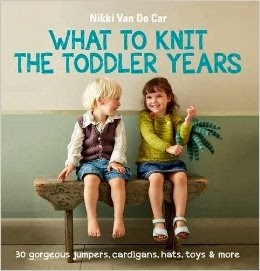 I said this was one baby where we would get her awesome presents, but I just wouldn't knit anything. And then, of course, she was born, and I forgot all about what I said (though Dave tried to remind me) and rushed off to make these for her. They are sweet and tiny, and made on US1 circs with Pine Woods Yarn Nylon Sock. Really do love that yarn. And I love the Bockstarck way. Anything that involves avoiding dpns works for me (I had a run-in with dpns recently that I'll go into soon enough. Suffice it to say, the dpns lost, but there were heavy casualties on all sides). See that lacy scalloping on the straps? That's what forced me to learn how to long-tail cast on. * The scalloping works fine for a little girl baby, but it's not how anybody else's straps look, and I don't love it, and I want it to stop. What neat and tidy cast on do other people use? Anyway. No more knitting for other people's babies, I swear. Unless they happen to be particularly cute. But otherwise no. *The irony being, of course, that one can't cast on using long tail when adding stitches mid-pattern, which is what you do for these straps. Can one? That would be nice to know. If i'm understanding you correctly (and i haven't made these booties, so maybe I'm not), wouldn't you use a cable cast-on to add stitches mid-row? They're adorable, BTW. I used a knitted cast-on, worried that cable would be too bulky. I'll probably try that next time. 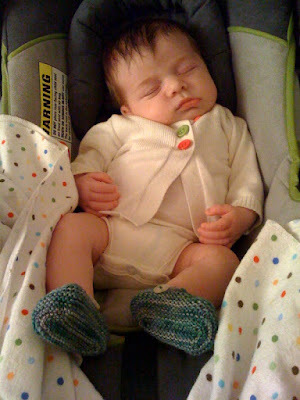 Imogen Sofia LOVES these booties!! She's actually wearing them right now.... They keep her little feet nice and toasty, and they look great too!!!! THANK YOU NIKKI!!!!!! :) and we'll definitely keep those photos coming! !